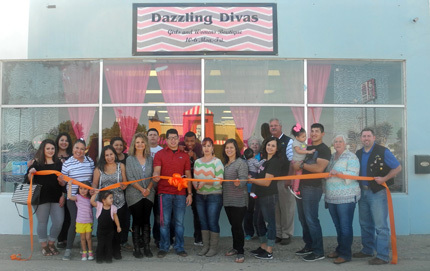 Members of the Artesia Trailblazers and staff of Dazzling Divas celebrate the grand opening of the new business Saturday with a ribbon cutting. Dazzling Divas is a clothing and accessories boutique located at 1407 ½ W. Main St. Pictured from left are Kristen Juarez, Laura Tulk, Elizabeth Favela, Aubriella Favela, Sarah Rojo, Avaeh Rojo, Victoria Mendoza, Isaiah Farmer, Lawanda Goodman, Joey Lopez, Travis Wilkinson, Alma Martinez, Vanessa Lopez, Roberta McCaw, Jessica Armendariz, Perry Troublefield, Chris Morales, Susie McCaw and Jesse Brownfield. “I’m so grateful for everybody who’s here and supporting me,” said Martinez, owner of Dazzling Divas.